We usually respond within 24 hours on weekdays. The VanGuard 1100SP Series Stereo Microscopes are intermediate-level instruments that have binocular heads with a 360-degree rotation capability and a fixed 45-degree vertical inclination to ease eye strain, -5 to +5 dioptric adjustment capabilities to compensate for the difference in viewing ability between each eye, and 51 to 77mm interpupiliary adjustment for individual eye spacing. The models in this series have 20mm 10x widefield eyepieces that conform to the Deutsches Institut f? R Normung (DIN) standard; stereo objectives (1x and 2x, 1x and 3x, 2x and 4x, or 1x and 4x); are parfocal and parcentered with revolving turret objectives so that items stay in focus when objectives are rotated; and have a working distance of 102mm. The stage plate is reversible black and white for viewing light or dark samples, and the microscope has two, locked on, stainless steel, spring-loaded stage clips for durability. The microscopes have dual, knurled focus adjustment knobs, for controlled focusing. These units have a rack and pinion assembly, a slip clutch mechanism, and a tension control mechanism to protect the gears. The stand is a solid, stainless steel pole stand with 65mm of total vertical travel ability, and vertical clearance of 65 to 175mm. They are stain-resistant and have a durable cast metal body with an enamel finish, and anti-skid rubber feet. These models come with two eyecups, a dust cover, and instructions. Stereo microscopes create three-dimensional images and are used? For education, biological sciences, and manufacturing applications, among others. 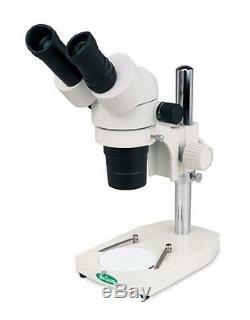 Microscopes are instruments used to enhance the resolution of an object or image. Types include compound, stereo, or digital. They can also utilize LED, fluorescent, and mirror light sources to help control viewing capabilities. Microscopes are widely used in education, lab research, biology, metallurgy, engineering, chemistry, manufacturing, and in the medical, forensic science, and veterinary industries. Vee Gee Scientific manufactures laboratory equipment and supplies, and makes the VanGuard brand of products. The company, founded in 1981, is headquartered in Kirkland, WA. Intermediate-level stereo microscope creates three-dimensional images for basic research and educational applications - Binocular head with 360-degree rotation and fixed 45-degree vertical inclination to ease eye strain, -5 to +5 dioptric adjustment capabilities to compensate for the difference in viewing ability between each eye, and 51 to 77mm interpupiliary distance adjustment for individual eye spacing - 20 mm 10x widefield eyepiece (DIN); stereo objectives (1x and 2x, 1x and 3x, 2x and 4x, or 1x and 4x); parfocal and parcentered with revolving turret objectives so that items stay in focus when objectives are rotated; working distance of 102mm - Black/white reversible stage plate to view light or dark samples, and locked-on, spring-loaded, stainless steel stage clips for durability - Knurled focus adjustment knobs, for controlled focusing, rack and pinion assembly, slip clutch mechanism, and tension control mechanism to protect the gears. VanGuard 1125SP Stereo Microscope with Binocular Head and Pole Stand, 10X Eyepiece, 1X and 4X Objective, 10X and 40X Magnification. The item "VanGuard 1125SP Stereo Microscope with Binocular Head and Pole Stand, 10X 1X and" is in sale since Wednesday, February 15, 2017. This item is in the category "Business & Industrial\Healthcare, Lab & Life Science\Lab Equipment\Microscopes". The seller is "intuii" and is located in US. This item can be shipped to United States, to Canada, to United Kingdom, DK, RO, SK, BG, CZ, FI, HU, LV, LT, MT, EE, to Australia, GR, PT, CY, SI, to Japan, to China, SE, KR, ID, to Taiwan, ZA, TH, to Belgium, to France, to Hong Kong, to Ireland, to Netherlands, PL, to Spain, to Italy, to Germany, to Austria, to New Zealand, PH, SG, to Switzerland, NO, UA, HR, MY, CL, CO, CR, PA, TT, GT, HN, JM.